GrImage (Grid and Image) is a test-bed dedicated to interactive applications. GrImage aggregates commodity components for high performance video acquisition, computation and graphics rendering. 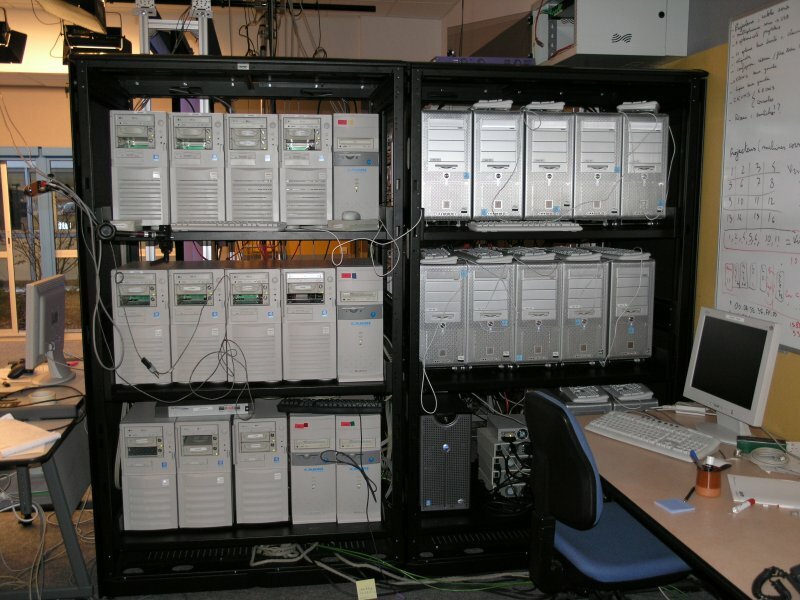 Computing power is provided by a PC cluster, with some PCs dedicated to video acquisition and others to graphics rendering. Part of the technology developed for Grimage is commercialized by the 4D View Solution company. You can find examples of 4d datasets in the 4D Repository website. 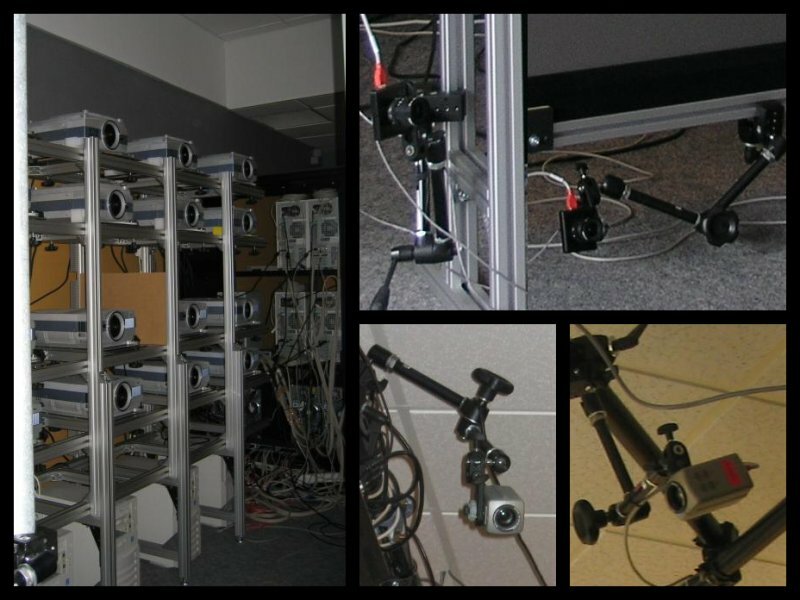 A set of digital cameras enables real time video acquisition. The main goal is to rebuild in real time a 3D model of a scene shot from different points off view. A display wall built around commodity video projectors provides a large, very bright and very high resolution display. The main goal is to provide a visualization space for large models and real time interactions. 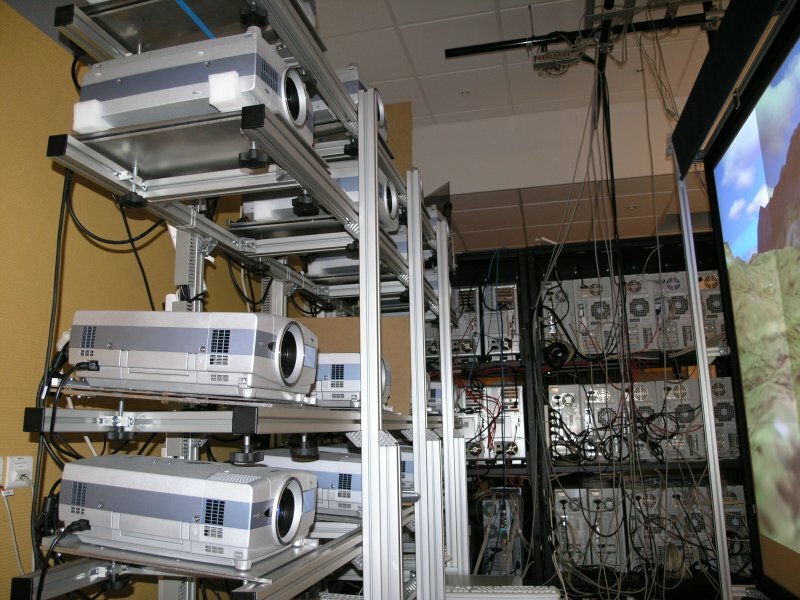 If extra computing power is required or for collaborative and multi-site experiences GrImage is connected to the i-cluster 2 cluster and to the french experimental grid platform Grid5000 through a high performance network. Grimage became the stage of a distributed musical performance, bringing together five artists from four locations across Europe. The show is the result of a joint effort between research teams in Barcelona, Poznan and Grenoble. 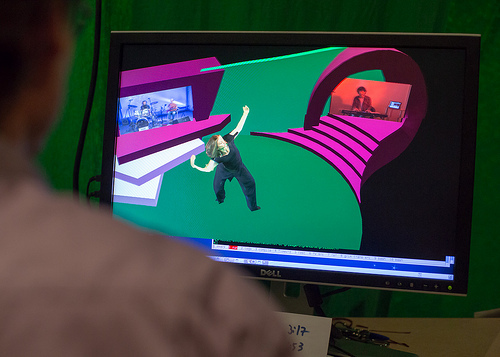 The live transmission was streamed to Vilnius during the ICT2013 with all artists performing in real time, together, on a single virtual stage. Drummer and guitarist from Poznan (Poland), pianist from Barcelona (Spain), dancer from Grenoble (France) and lyrist from Vilnius (Lithuania). Video of the performance (ICT2013). Poznan's version of the same: long and short. 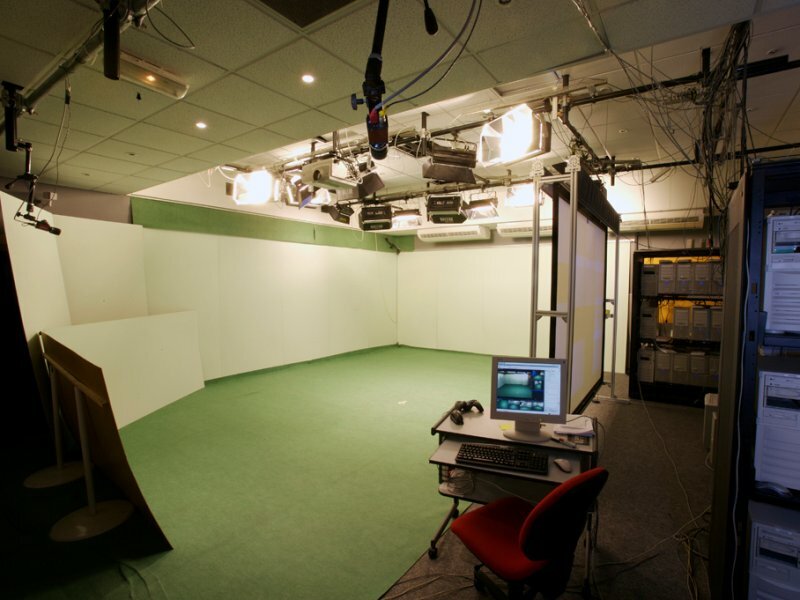 The GrImage setup was used to reconstruct the dancer in real-time and merge video streams from Poznan, Barcelona and Grenoble into a single scene. The presentation showcases the potential of reconstruction platforms such as Grimage, which have widely acknowledged applications in arts that could be used in fields such as remote surgery and professional training. Grimage acquired the new SONY HMZ-T1 a brand new Head Mounted Display which is truly immersive and offering High Definition 2D and 3D viewing with virtual 5.1 surround sound. Ideal for 3D movies and gaming, twin OLED screens deliver a high contrast image. This HMD will be used for displaying the 3D model of Grimage for the user in immersion into the platform. More informations about the HMZ-T1 ... .
Grimage took part on the 8th of March at the inauguration ceremony of the wing G of the INRIA building. A specific scenario has been made up for this event. Each one of the five VIPs had to push up a virtual button.This action launching a virtual reconstruction of the building rising up from the floor in 5 steps. This event was recorded in live by a cameraman and broadcasted for all the guests that couldn't enter the small virtualization room. ScreenShots of the VIP ... .
Grimage becomes Kinovis, a large environment for the visual perception of shapes in motion. Kinovis will have more cameras (50x5MP instead of the currents 8x1MP) but also depth cameras (TOF) and a larger acqusistion space of 15x7x3 m instead of the 1m radius current acquisition space. Kinovis will have as well 2 Head mounted displays, motion capture equipment ART and ViconImproved, a software interface : Kinodev and Millimetric static mesh capture : Arthtroscan. Slides about Kinovis ... . Since 2012, the Grimage cluster is managed a la Grid'5000, using OAR to access resources and Kadeploy3 to allow to run any OS environment and open the possibility of modifying it, or just being root. The Grimage cluster is not completely part of Grid'5000 but it shares the same IP network as Grenoble Grid'5000 site, allowing to access Grid'5000 machines from Grimage machines et vice versa. Routing to other Grid'5000 sites/machines is provided by the Grid'5000 router of Grenoble. Hence the IP addresses of the Grimage nodes follow Grid'5000 network rules.The Grimage cluster is also interconnected with Infiniband, using the Grid'5000 Infiniband infrastructure (switches) of Grenoble. But the cluster uses it's own OAR and Kadeploy setup. More informations ... .
Visionair is an international agreement that enable the European partners researchers to benefit from state-of-the-art technologies. The G-SCOP Laboratory, as leader of the project is coordinating the 25 international partners from 12 different countries. More informations ... . The full-body Grimage platform will be presented at Siggraph Emerging Technologies in New Orleans from the 3rd to the 7th of August. More information can be found here. The GrImage platform in it's portable version was presented in Paris at the "Ville européenne de la science" (European science city) exposition that took place in Paris from Friday 14th to Sunday 16th of November. The platform was presented in the Inria's "Digital village". At this occasion, we were filmed by the french TV channel TF1. Here is a link to the TV report. The GrImage website has been updated. This update includes a lifting of the website's look and feel as well as the integration of a popup system for images. There were also some fixes concerning the images. The videos are now embedded within the pages for easier viewing. Grimage and its sister platform built by the i-parla team were showcased at VRST 2008. Both platforms enabled two different users to meet in a common virtual space and share virtual objects. Click here to view the video. A small-scale GrImage patform has been built for external demos. It has been showcased at SIGGRAPH 2007 EMERGING TECHNOLOGIES, San Diego, from the 2 to 9 of August 2007. See the submission video.